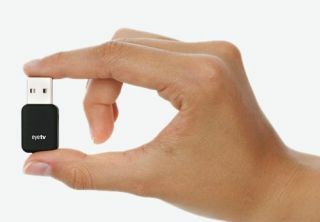 Elgato has just announced the release of the smallest Freeview stick in the world – the EyeTV DTT Deluxe. No bigger than your average novelty USB stick, the EyeTV DTT Deluxe brings DVB-T (Freeview) reception to either your PC or Mac. Like most computer accessories being released at the moment, the device is full compatible with Windows 7. To make sure you pick up the best signal the EyeTV device comes with a portable rod antenna; other than that though the dongle is free from any other cables. Also included in the box is a handy infrared remote. Depending on which type of computer you use, the EyeTV DTT Deluxe works with Windows Media Centre (PC) or iTunes (Mac). If you are using a Mac, then you have the added bonus of being able to stream TV content on to your iPhone via the device and also other Macs within your vicinity. The EyeTV DTT Deluxe is out now and will be available for £79.95. Go to www.elgato.com for more details.